Shades of Grey is a strange beast. It is a high concept, satirical novel set in a dystopian (or, perhaps, anti-utopian) future, where human civilisation has been static for about 500 years after a "Something that Happened" apocalyptic event. The humans in this world have tiny pupils in their eyes, and can only perceive a limited colour spectrum - or indeed, no colours at all. Their family names, their rank in life, their roles and occupations, are all determined by their colour perception. People who can see yellow become the police / enforcers. People who see violet / purple are the leaders. Greens and reds have varied roles in management and public services. Blues are librarians and guardians of knowledge. And greys are the worker bees, who do all the hard grafting in this world. Our hero, Edward Russett, is being shipped far away from the central towns of this chromatocratic nation, into a small town in the sticks, as punishment for rebelliously having suggested an improved queueing system (original thought is strongly discouraged), and to accompany his father, who has been seconded to temporarily replace the recently deceased medical professional in that community (a swatchman, they are called). Ed is a young man, almost 20 years old, who is just about to find out his fate in life / his colour-viewing abilities. He's trying to distance-woo a young woman who is higher up in the hierarchy, and would be an advantageous dynastic choice for his family. And, on the day the story starts, he witnesses a man's collapse, near-death, and a young grey woman (called Jane) with a very cute nose who watches the incident, concerned, from a distance. The novel is a slow reveal of the crazy world these people occupy, where colours are highly valued because of their aesthetics, but also because of their drug-like powers over the mind and body (green colours are opiate equivalents, for example). It's also a world where the lightless night holds incredible terror for the citizens, every aspect of their lives is determined by a lengthy rule book created hundreds of years ago by an obsessive, perhaps OCD-afflicted dictator, every few years the society purges itself of old knowledge and technology by a "leap back", suddenly declaring entire swathes of technology forbidden, wealth is measured in merits (earned for snitching and being valuable to the community), etc. etc. etc. - it's a world with many quirks. Some of these are satirical and vaguely amusing (spoons, forbidden from being manufactured, have become a secondary currency of sorts), others are a bit pointless. Our characters, meanwhile, are our narrating hero, the feisty, confrontational, cute-nosed, somewhat violent lady of his desires, some yellow and purple youths who are deplorably unpleasant, some red and green and blue youths who are vaguely pleasant but unimportant, and an artful dodger type who arranges many things, always with his self-interest at heart, devious, but not quite pure evil. Jasper Fforde has sometimes been described as the "Welsh Terry Pratchett", but he certainly isn't. The number of jokes per page / chapter is much lower. His novels are gently amusing rather than downright funny. He is much more high-concept (Discworld, once you go past the turtle-elephant-disc construction of it, is just a satirical fantasy world, with wizards and dragons and so on). But the two of his novels that I've read so far were both, ultimately, less engrossing. From what I've read, his characters tend to be a bit less interesting, and Shades of Grey does lack strong charisma. (The artful dodger type is probably the most interesting character to be around, followed by the apocryphal man, but neither entirely steals the show). 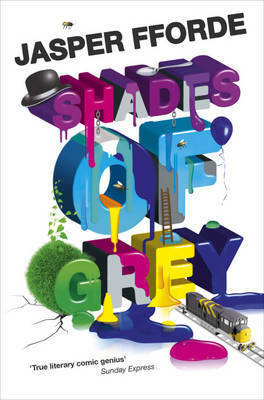 Shades of Grey is a novel I would quite like to love, but don't. Pleasant enough, but sadly, no more than that. I should also add, with hindsight, that Jasper Fforde has written some much more enjoyable novels - The Big Over Easy, The Fourth Bear, and the YA Dragonslayer Novels are superbly enjoyable.